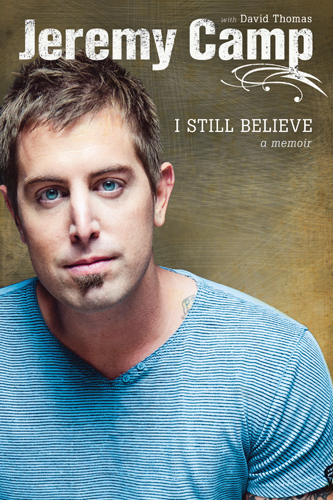 I picked up Jeremy Camp's memoir, I Still Believe, because I love this genre of book. Camp's memoir is honest, open and at times, even painful, as he recounts how God has moved in his life - especially with the illness and ultimate death of his first wife, Melissa. In fact, the story opens with Camp struggling to pick up his guitar and write music again after Melissa's death. Through the pain and healing, Camp wrote the song that became the title of his memoir - I Still Believe. Belief is the thread that runs through this book. Through the ups and downs of his life, Camp shows how his faith has grown even amidst the trials. He weaves in the lyrics, so readers can get the "back-story" behind his songs. The memoir also shows how God brought his wife, Adrienne, into his life, and the ups and down of that relationship - including the loss of their third child to miscarriage. It also walks through the roller coaster of his musical career. Ultimately, Camp's story is one of hope and redemption. It doesn't show a life that's been all "rainbows and lollypops" but instead shows one that is authentic in actions, words and deeds. I enjoyed reading this book. It encouraged me, gave me hope and truly gave me something to think about. Reading it in public, gave me an opportunity to have a candid conversation with a stranger. Camp could have written a book that sugarcoated everything that happened in his life so far - but instead he decided to "rip off the band-aid" and write a candid account of his doubts and struggles. Through it all, his faith shines through as a strong witness. On a scale of one to five, I give this book a solid four and a strong recommendation.